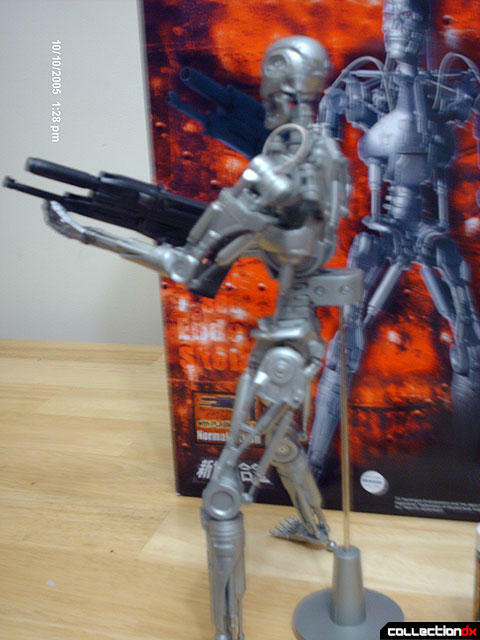 Terminator 2 Judgment Day - 1/6 Scale T-800 Is made by Aoshima, and like its ventures into Thunderbirds and Getter Robo, the Chogokin is well-crafted and full of diecast. 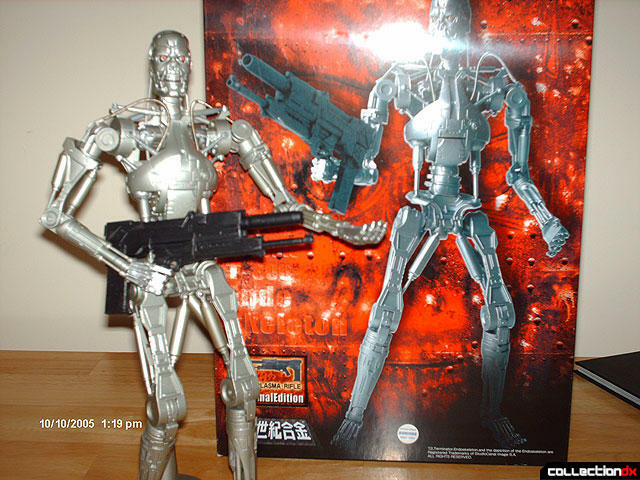 The Terminator figure is big, similar in size to Masterpiece Convoy/Optimus Prime by Takara. 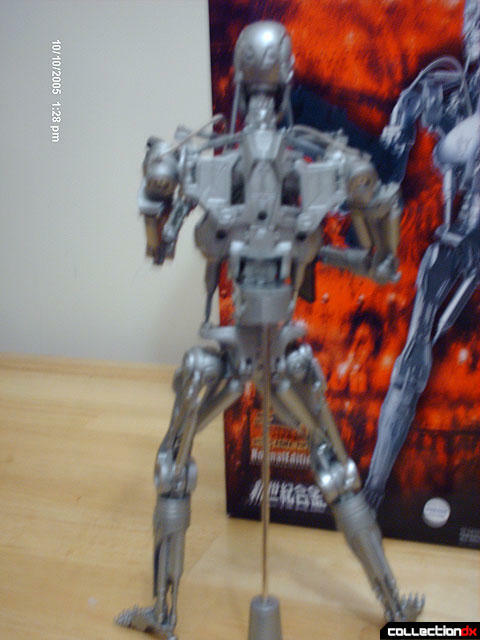 It has impressive metal content and is very heavy upon holding the figure. It has tons of pistons and joints that work and some that are just plastic for show. 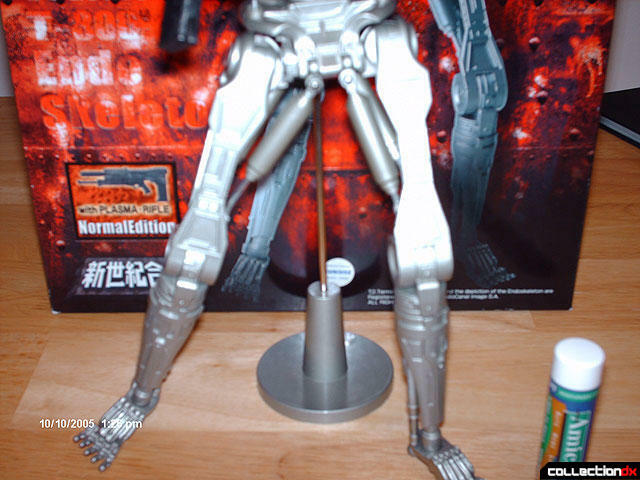 The figure comes with a stand that clamps onto the back of the figure to provide stability when posing (he is top heavy). They just rest into two holes near stomach but attach to the arms with pin size pieces of plastic. The angle is awkward and they can easily snap. Mine did; I had to do some repair work to reattach them, and even now, if you move arms by the shoulders, you have to be very careful. I love this figure, the imposing stares, the large size, and the cool positions and gear type look. 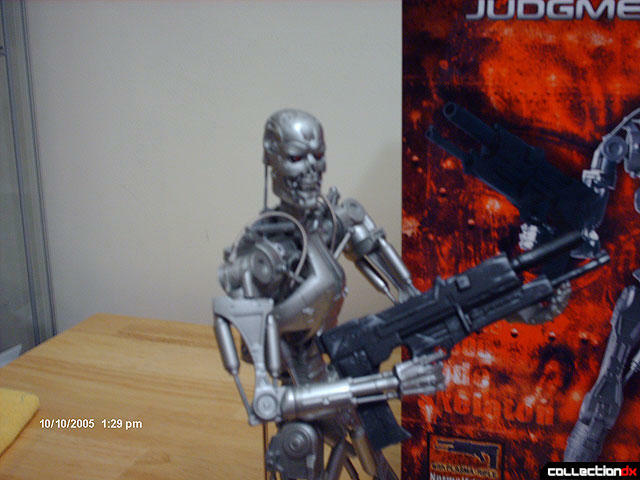 All the pictures are of the normal version; there is a also a weathered version that comes with different gun. I bought from Statue Toys for 130USD not including shipping; not a cheap chogokin, but not extreme like the Fewture line. 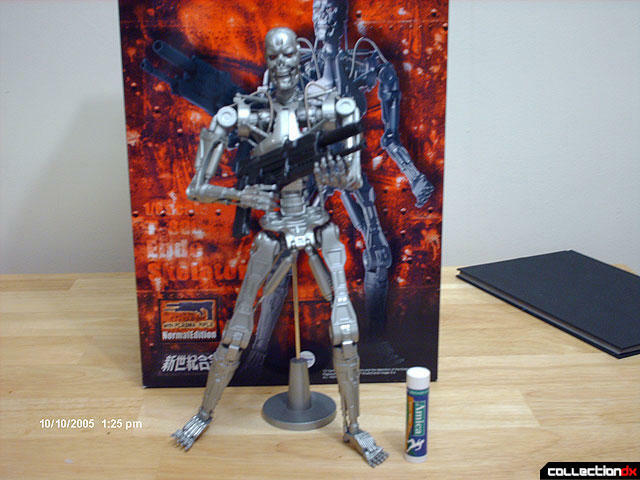 Overall a nice piece for chogokin fans or Terminator fans alike. Very very tough... specially when todays toy price. I've always wondered about the quality of these figures. Cool to hear about them! 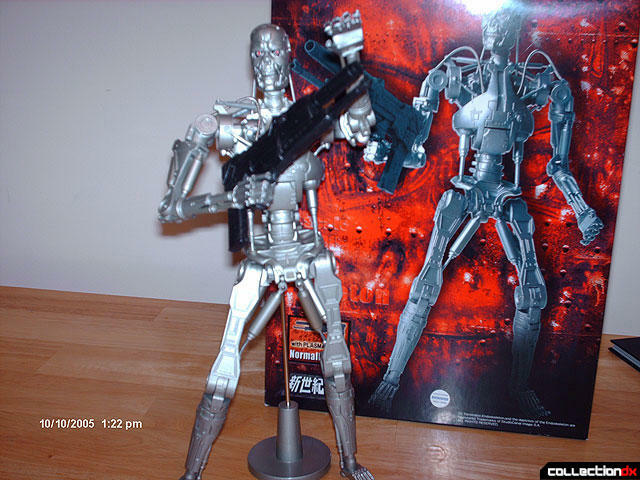 The diecast content is pretty key for a character like this! One thing I'd suggest, though...you can definitely improve on your photos with a simple, cheapie tripod, a backdrop (even just a white sheet draped down the wall onto your table), a little more even lighting. If your camera's decent enough, you can play with the white balance settings (to get more accurate color), macro mode (to get sharper pics), and aperture/shutter speed settings (to get perfect lighting in the shots). Macro mode plus a timer/delay and the tripod will ensure that your pics are super-sharp. Good luck and have fun with it! Looking forward to more! Since I don't have mini studios, I use papers for background. But the tripod is a must. Yeah, if you have sufficient light, a tripod isn't always necessary. But with just ambient room lighting, you need one for sure.